I hope everyone of you had a Happy Easter (in case you celebrated)! 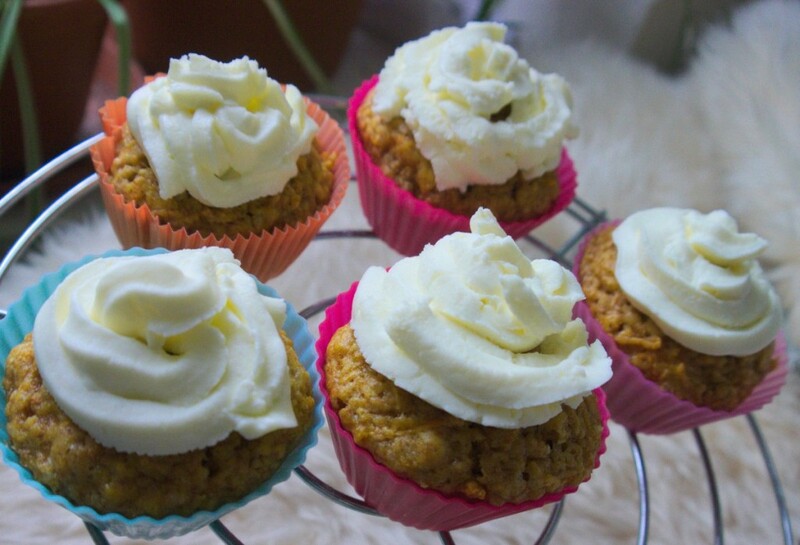 I have really enjoyed the long weekend and used the time to sleep, relax and make some classic Easter sweets like these carrot cupcakes with cream cheese frosting. I have been a fan of carrot cake all my life so I tend to like these cupcakes at any time of year – not just for Easter. They also make great breakfast treats or additions to your work lunch. Plus, they are packed full of healthy ingredients. 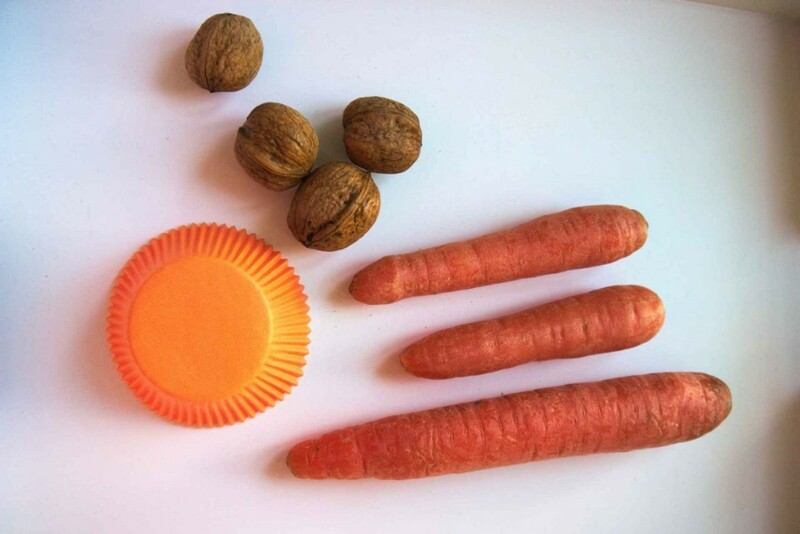 The carrots also have such a high natural sugar content that you could easily reduce the sugar a bit more if you’re trying to cut down on refined sugar. This dough is customizable to taste, of course. And they even taste good without the cream cheese if you want to give the rich frosting a miss. 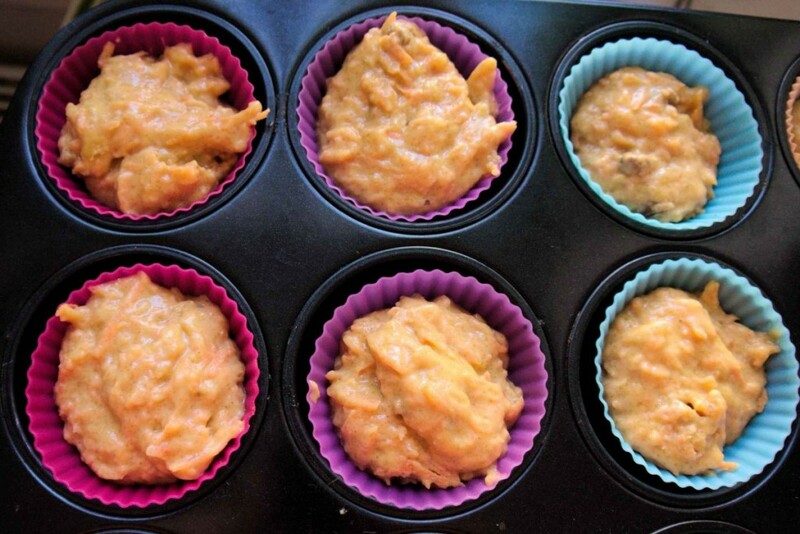 I’m sure you all have your own recipes for carrot cupcakes but I have tried a few by now and this is a firm favourite. It is from usa-kulinarisch (a great German site with American style recipes). You can use regular flour instead of half wholemeal flour. I just like the hearty taste it adds plus it contains more macronutrients and minerals. I used buckwheat flour for my cupcakes. I omitted cloves and nutmeg although I like their taste but that makes the dough more autumnal. I also usually add a pinch of salt although that’s totally optional. For oil I used canola oil which I quite like for baking. Safflower is another favorite of mine and boasts an even better heat tolerance. Although I think nuts go perfectly with carrot cake taste wise these are entirely optional. So if you can’t eat nuts, are allergic or simply don’t have any at home, no worries, these cupcakes are yummy without the nuts too. Make sure that butter and cream cheese are at room temperature when making the icing. This is essential for getting a nice texture! The preparation is really fast and easy. You need two bowls each, one for the dry and one for the wet ingredients. Mix dry ingredients (sugar, flour, baking powder and soda, spices, nuts) and wet ingredients (lightly whisked eggs, oil, orange juice and carrots) well separately. Then fold the wet into the dry ingredients until well incorporated (take care to not over mix). Evenly fill the batter into muffin cups (makes about 9-12 cupcakes) and place rack in center of oven. Beat butter and icing sugar until white and creamy. Then add the cream cheese and quickly incorporate. Make sure that both butter and cream cheese are at room temperature (I made that mistake once and the icing came out all lumpy and unattractive for piping). Chill for at least an hour before using. Then you are free to decorate the cooled cupcakes with frosting and sprinkles of your choice – the fun part! This frosting can be stored in the refrigerator for several days. Do you have a favourite carrot recipe? I’d love to know. 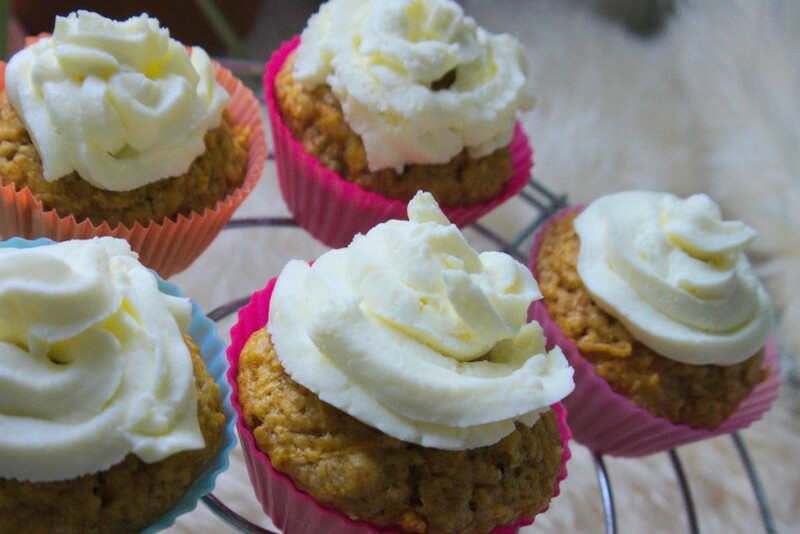 Möhrenkuchen gehört schon lange zu meinen Favoriten, weshalb ich auch diese Carrot Cupcakes das ganze Jahr über gerne esse. Ich finde sie auch zum Frühstück sehr lecker oder nehme sie als Mittagessen zur Arbeit mit. Durch Möhren und Nüsse sind sie ausserdem ballaststoffreich und mal etwas anderes als ein langweiliger Schokoriegel. Diesen Basisteig kann man natürlich beliebig abwandeln und dem eigenen Geschmack anpassen. Das Rezept stammt von usa-kulinarisch.de und ist eins meiner Favoriten für Möhren-Cupcakes. Sie schmecken auch ohne das (recht mächtige) Frosting lecker und auch den Zuckergehalt könnte man durchaus noch etwas reduzieren, wenn man raffinierten Zucker umgehen möchte. Das Vollkornmehl kann man natürlich weglassen und durch normales Mehl ersetzen. Ich mag den Geschmack aber recht gerne, zumal es reich an Mineralien und Ballaststoffen ist. Ich habe in diesem Fall Buchweizenmehl verwendet, was sehr gut funktioniert hat. Wer möchte kann noch eine Prise Nelken und Muskatnuss hinzugeben. Das habe ich dieses Mal weggelassen, da ich diese Kombination schöner für den Herbst finde. Ist aber natürlich jedem selbst überlassen. Das gleiche gilt für Orangenschale oder -Aroma, was zwar sehr gut dazu passt, mir aber auch eher zu viel ist. Eine Prise Salz gehört für mich auch immer dazu – kann man aber ebensogut weglassen. Wenn man mal keine Nüsse im Haus hat oder sie nicht verträgt, ist das auch nicht schlimm. Aber für mich gehören sie zu einem Möhrenkuchen einfach dazu und sorgen grade in Kombination mit der Frischkäse-Creme für das besondere Geschmackserlebnis. Den braunen Zucker in einer Schüssel mit dem Mehl, Backpulver, Natron und den Gewürzen mischen. In einer weiteren Schüssel Öl mit den vequirlten Eiern und Orangensaft verschlagen. Dann die Möhren unterheben. Die feuchten mit den trockenen Zutaten zügig miteinander vermischen. Den Teig auf 9-12 Muffinförmchen verteilen und bei 180°C etwa 20-23 min backen. Butter und Puderzucker mit dem Mixer cremig schlagen. Dann den Frischkäse hinzufügen und kurz verrühren. Mindestens eine Stunde kalt stellen bevor das Frosting zum Dekorieren verwendet wird. Daruf achten, dass Butter und Frischkäse auf Zimmertemperatur sind. Ich habe diesen Fehler schonmal gemacht und mich dann über die wenig cremige Konsistenz geärgert. Das Gute ist, dass man das Frischkäse-Frosting im Kühlschrank sehr gut einige Tage aufbewahren kann. They look so good, thanks for sharing! 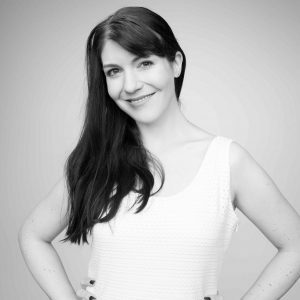 I think your blog is lovely, let me know if you would like to follow each other! Ach wie lecker, darauf hätte ich jetzt richtig lust! Love traditional carrot cake! They look delicious! Amazing recipe idea, love this cupcake, so smart, it must be very delicious! I want a bite of it now. These look amazing! I like the idea of using the buckwheat flour instead of regular. I’ll have to try this recipe. Yes!! These look delicious and made me hungry! Need to make them! Uhm so delicious! I’m definitely trying that one day!!! Looks so good and tasty!